Greenland as a frozen world, but smaller than the other frozen world, Antarctica. However, satellite images [above] show a wildfire burning in western Greenland. The fire is big enough, about the size of midtown Manhattan, to be detected by satellite. 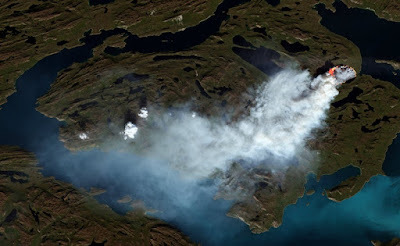 Small wildfires are not uncommon in Greenland, but are too small to be seen from above. Experts are not sure what started the fire. The fire is in an area that is semi-arid, but climate change is increasing the local temperature and more shrubs are growing as the growing season lengthens. Droughts will be more frequent too, so large wildfires will be a more common occurrence in Greenland. All across the Arctic boreal forests are burning at a rate not seen in 10,000 years. Of course this burning will release from storage millions of tons of carbon dioxide into the atmosphere, which will in turn impact global temperature.